There are certain beers that I will always associate with specific eras or moments in my life, and Allagash White definitely is one of those beers. About 4.5 years ago I met a girl for a first date. I chose Audubon Circle as the venue, that was always a go-to place for me, cool atmosphere without being stuffy, noise level that facilitated conversation and a very good drink menu. While the bar had a full cocktail menu and a solid selection of wines by the glass, my date ordered an Allagash White. She didn’t know that I was a beer geek in training, that was just one of her favorite beers. I don’t judge people on what they drink, but I have to say that I was impressed that she ordered a local craft beer. It probably won’t come as a shock that this date led to many more, and that girl is now my wife (I wouldn’t be writing about this if it was some random girl I went out with years ago). Now every time I see Allagash White it reminds me of the first date with the woman I would marry, a truly happy memory that led to many more. It’s funny, I don’t recall exactly what I drank that night, I think it was Stone IPA, but I’ll never forget what my future wife ordered. 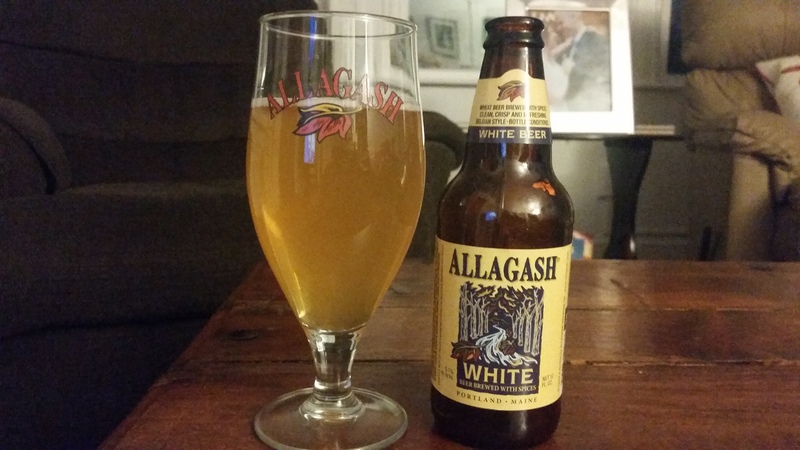 It seemed perfect to review Allagash White as part of my first Hoppy Boston classic beer week. Allagash White is a traditional Belgian witbier brewed with a liberal dose of wheat, fermented with Belgian style yeast and spiced with coriander and Curacao orange peel. It is available year-round on draft and in 12 oz. bottles. Allagash White pours a cloudy straw yellow with a mild white head. The scent is pretty mild, a touch of Belgian yeast and a little spice. The first thing that comes to mind as you sip this beer is how light bodied and easy to drink it is. The flavor isn’t in-your-face, but it’s subtly complex. The yeast adds notes of pepper, bubblegum and apple while the malts contribute wheat and toasted bread. The spices are noticeable, coriander and orange, but not overpowering. Everything works well together, they squeeze a ton of complex flavor into the beer while keeping it approachable. At 5% ABV this is a borderline session beer (depends on your definition), perfect for sipping on the porch on a warm spring day. There is a reason why this beer is a classic, witbiers aren’t my favorite Belgian style but this one is very well done. I often recommend Allagash White as a “starter” craft beer for people who want to start trying different beer styles, but veteran craft beer drinkers should also give it a taste every so often. Hoppy Boston score: 4.5/5.